Yakuza 6: The Song of Life will be released in North America and Europe on March 20. The game will be the last chapter in the story of long time protagonist Kazuma Kiryu. In addition to the announcement of the release date, a premium edition of the game was also revealed. Here’s the press release. 18 August 2017 – The final chapter of Kazuma Kiryu, the Dragon of Dojima and main protagonist of SEGA’s long-running Yakuza franchise, will soon come to a close when Yakuza 6: The Song of Life debuts in the Americas and Europe on March 20, 2018. The game will be available physically and digitally on PlayStation®4, and thanks to the new “Dragon Engine,” is the most technologically advanced Yakuza title to date. · Hardcover Art Book – The intense human drama and magnetic world of Yakuza 6 will be on display in this stunning art book. We’ll have more details on what will fill the pages at a later date. · 2 Bar Glasses (280ml) – Designed with Kiryu’s ferocious dragon tattoo, these bar glasses are the perfect receptacles for your beverage of choice. · 2 Ice Stones – Cool down your drinks with a pair of heat action branded ice stones! One features the flame heat action icon, while the other has the Japanese “kiwami” heat action icon. Chilling has never been so… extreme. · 2 Coasters – A true yakuza knows how to relax with class, so coasters are a must have when lounging after hours. Protect table surfaces with style by placing your glasses on top of official Tojo Clan branded coasters. Plus, you won’t need to play the “is this my drink?” game because of their inverted colors! · An Outer Box – All of these essential tools will be housed within a collectable outer box. If indulging in libations isn’t up your alley, you can pre-order or grab the limited launch edition of the game which contains a sleek hardcover art book that also doubles as the disc holder! From the unparalleled realism of the new setting of Onomichi, a beautiful, sleepy port town in Hiroshima Prefecture, to the latest evolution of Kamurocho, the biggest red-light district in Tokyo, Yakuza 6 is the ultimate iteration the game’s blend of gritty crime story, hyper-explosive combat, and all the vices and distractions those locales have to offer. · Enter the “Dragon Engine” – Explore the world of Yakuza like never before. Yakuza 6 is the first current-gen Yakuza title that was developed from the ground up for the PS4, introducing the seedy Japanese underworld with detailed visuals, lifelike animations, a new physics engine, interactive storefronts, seamless transitions and more. That’s right! Fights can start on the streets and end in a pile of shattered glass, scattered snacks, and bruised bodies on the floor of the nearest Poppo convenience store. 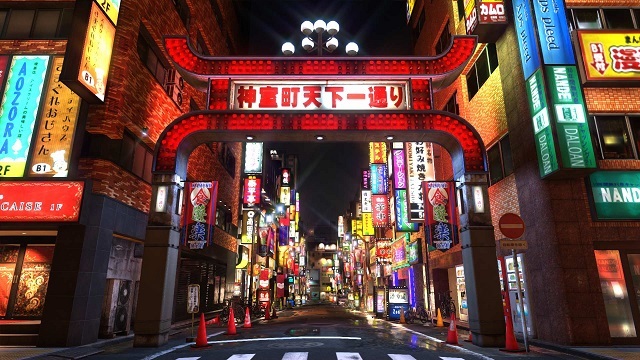 · Explore Kamurocho Reborn and the Scenic Views of Onomichi – Speaking of Dragon Engine, the hypnotic lights, opportunistic inhabitants, and hedonistic distractions of Kamurocho look better than ever. Revamped minigames like karaoke, batting cages, darts, hostesses, and the SEGA arcade have been streamlined for maximum pleasure, and new additions like the RIZAP Gym, Cat Café, and Clan Creator are the purrfect distractions after a long night of bashing heads! But it’s also time to get away from the hustle and bustle of city life to play tourist in beautiful Onomichi. This tranquil coastal community is home to plenty of local activities like bar mingling, spearfishing (think action-packed rail shooter … with fish), and more! · Let the Bodies Hit the Floor – Yakuza 6 Kiryu is a 100% certified thugfed OG, so that means he’s a battle-hardened veteran when it comes to the art of street fighting. Although he utilizes one fighting style this time around, you best believe Kiryu hits like a truck. Devastating combos and bone-breaking Heat Actions make a return, but now the Dragon of Dojima can fill up a meter to engage Extreme Heat Mode. When activated, Kiryu glows blue and unleashes heavy-damage combos with his fists or any “tool” that’s close at hand. Painting painful masterpieces has never felt so good. · Fully Voiced Japanese Audio – For the first time in series history, every line and piece of dialogue is fully voiced in Japanese. Let the dramatic story and absurd humor of the series unfold like an interactive foreign film experience. The game has not yet been rated by the ESRB, USK, PEGI, or OFL and for more information please visit: http://yakuza.sega.com.